Fall is officially here! And while it may be starting to cool down where you live, you can still get outside with your children and have a great time! My kids love to be outside most of the time, especially when they won’t come in dripping from sweat. So during the fall, we often take hikes and nature walks to break up our days. They love to find beautiful leaves – the bigger, the better – acorns, unique rocks and more! I love that they are out of the house and enjoying God’s creation. 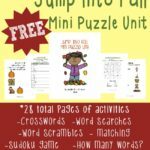 But as a homeschool mom, I am always looking for ways to bring learning in to their everyday lives organically. I want them to know that they can learn in any situation. That’s what I love so much about scavenger hunts. 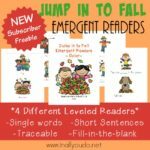 They can be tailored to fit any subject or theme – even the senses. If you take hikes or even short nature walks with your kids, there is so much to see, hear, feel, smell and even taste! 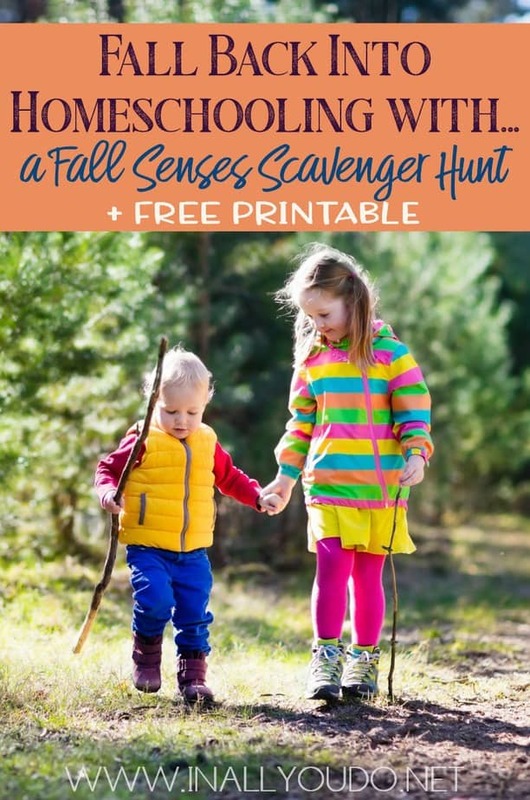 In fact, fall is the perfect time for kids to explore the outdoors using their senses! You can do as much or as little as you like on the nature hikes. For instance, you can concentrate on one sense, such as touch. 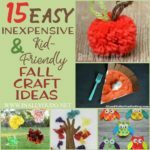 Have your kids find as many objects as they can with different textures. Note: Be sure to educate them on identifying harmful leaves, plants and berries before you head out! If you have a group of friends over, separate into teams and see who can find everything on the list first. Or have each group take a sense to focus on during their hunt and when they come back share what they’ve found. 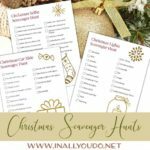 Make your scavenger hunts more interesting by suppressing the other senses to heighten the one you’re focusing on. For instance, blindfold members of the group if you’re concentrating on feeling, hearing or smelling. Put in earplugs, if you’re working on sight. Have them wear gloves if you’re working on smell. Whatever it is, make sure it’s fun and help them explore their other senses. 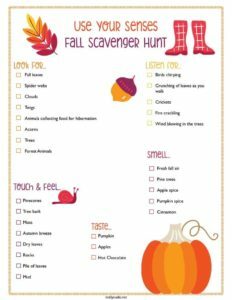 Scavenger Hunts are a great way to get kids excited about exploring the outdoors, even if they are hesitant. Not only can they explore their different senses, they can find new and exciting animals, and nature specimens that just might lead to more studies. I have created a simple cheat sheet of sorts for you all. 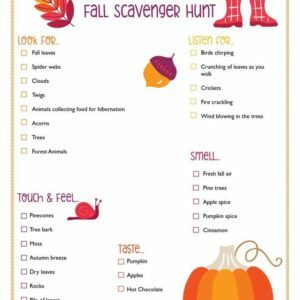 My fall senses scavenger hunt will encourage your children to explore the fall scents, tastes, and so much more!